The world’s smallest game of tic-tac-toe could have a big impact on the future of nanotechnology. Researchers from the California Institute of Technology (Caltech) have developed a new technique for shaping structures out of strands of DNA, a process known as DNA origami. Unlike previous techniques, which effectively locked a structure in place once created, the researchers could reshape an already-constructed DNA structure using this new technique. To demonstrate the powerful new technique, they used it to play game of tic-tac-toe using a DNA board. Because of course they did. DNA origami takes advantage of the natural tendency of DNA molecules, or bases, to pair up with one another. Each base — A, T, C, and G — pairs with another of the bases: A and T are a team, as are C and G.
Strands of DNA pair up based on these matches — a strand with a molecule sequence ATTGCGA, for example, pairs perfectly with a TAACGCT strand — and researchers can create shapes out of DNA simply by manipulating the sequences of the letters. 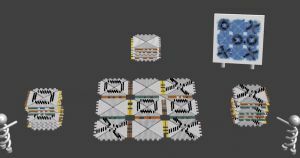 In a paper published on Tuesday in the journal Nature Communications, the Caltech researchers describe how they combined strand displacement with a DNA origami technology called self-assembling tiles. That involves the creation of square-shaped tiles of DNA designed to fit together like the pieces of a puzzle. To demonstrate their new DNA origami technique, the researcher put nine blank DNA tiles designed to form a three-by-three grid into a test tube. Once the tiles assembled, the researchers took turns adding X or O tiles to the test tube. The researchers designed those tiles to replace specific blank tiles in the grid using strand displacement — the new tile was simply a better match in the chosen spot than the blank tile. The game took six days, with player X emerging as the winner. But the research was about far more than just a game of tic-tac-toe. The ability to reshape DNA structures could prove immensely useful in the future, as scientists are already exploring ways to use DNA origami to deliver drugs and sort molecular cargo.